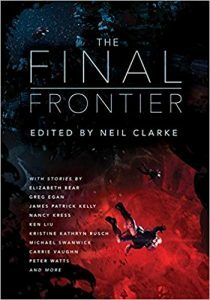 The Final Frontier, Neil Clarke, ed. (Night Shade 978-1-59780-939-9, $17.99, 579 pp, tp) July 2018. Cover by Fred Gambino. Is there something for everyone here? A genu­inely representative sample of current SF? 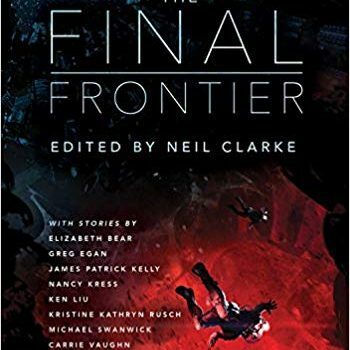 The contents page shows a mix of veterans (Michael Bishop, Greg Egan, James Patrick Kelly, Nancy Kress, Kristine Kathryn Rusch, Michael Swan­wick) and writers who have emerged over the last decade or less (Seth Dickinson, Ken Liu, Julie Novakova, An Owomoyela, Genevieve Valentine). There is certainly a decent range of material, including iterations of classic – or at least persistent – modes, tropes, themes, treatments, ideas, and implementations-of-possibilities for star travel and associated topics: First Contact and other alien encounters, virtualized and/or post-human crews, seedships, shipwrecks, spaceborne disasters, maroonings, rescue missions, escapes, and salvations in a variety of exotic environments. 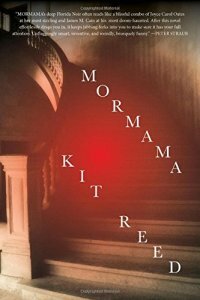 Seven of the selections run to novelette or no­vella length, and two of those are parts of larger projects. Kristine Kathryn Rusch’s “Diving into the Wreck” is the first section of what became a multivolume book series set in a future so distant that it has forgotten (or hidden) huge swathes of its own history. Here, however, that is background to a foreground emphasizing the very physical dangers of crawling around ruined spacecraft in vacuum and zero gee (“the sharp edges are ev­erywhere”) filled with lethally enigmatic ancient technologies. Peter Watts’s “The Island” is the introductory entry to his Sunflowers sequence, set millions of years into a project to thread the galaxy with a faster-than-light freeway of wormholes, and featuring encounters with beings right out of Olaf Stapledon (or maybe Lovecraft), if sometimes with longer, sharper teeth. Some aspects of this episode – the strained relationship between the crew and the ship’s guiding intelligence – snap into better focus when fitted together with its series-mates, but its particular problems – physical, metaphysical, moral, and alien-diplomatic – are pretty compelling all by themselves. Speaking of really long voyages in starships with minds of their own, James Patrick Kelly’s “The Wreck of the Godspeed” could be a second cousin of the Watts and distant kin to Nancy Kress’s “Shiva in Shadow,” but then I’d have to figure where to fit in its treatment of metaphys­ics and its transmogrified amateur adaptation of The Tempest. The Kress is as much about relationships, personal and organizational, as the astrophysics that provides the hazardous hard-SF environment for its exploratory expedition to the neighborhood of the galaxy’s central black hole. But the external hazards are not the most dangerous ones. Greg Egan’s “Glory” is a common-background companion to his earlier “Riding the Crocodile” but, more significantly, it’s also part of a larger family of Eaganian motifs and tropes dealing with the explo­rations of intelligences, embodied or virtualized as needed, driven by curiosity and love of knowledge for its own sake as much as by any other urge or desire. It has a distant cousin in Julie Novakova’s “The Symphony of Ice and Dust,” which packs two stories of exploration and alien discovery, eleven thousand years apart, into one frame. “Permanent Fatal Errors” by Jay Lake is full of sly digs at Heinleinian hyperindividualists. Sean McMullen’s part-puzzle, part-courtroom-drama “The Firewall and the Door” had me thinking of Jack McDevitt, both for its familiar future domes­ticity and its portrait of a culture that has turned away from space exploration for half-ethical and half-budgetary reasons. Vandana Singh’s “Sailing the Antarsa”, with its notions of cross-species kin­ship and “altmatter” wings catching interstellar currents, had me thinking of Le Guin, Nancy Kress, and David Lindsay’s A Voyage to Arcturus, though whether that last one represents an actual intersec­tion or some idiosyncratic neurological accident I can’t say. 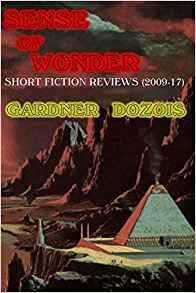 I end pretty much where I did with Infinity’s End, with a sense that there is as much continuity as novelty in this century’s science fiction, and that familiarity is breeding not contempt but ingenuity and second looks worth taking. There’s life in the old genre yet.